Micromax Ignite- A powerful laptop from Micromax. 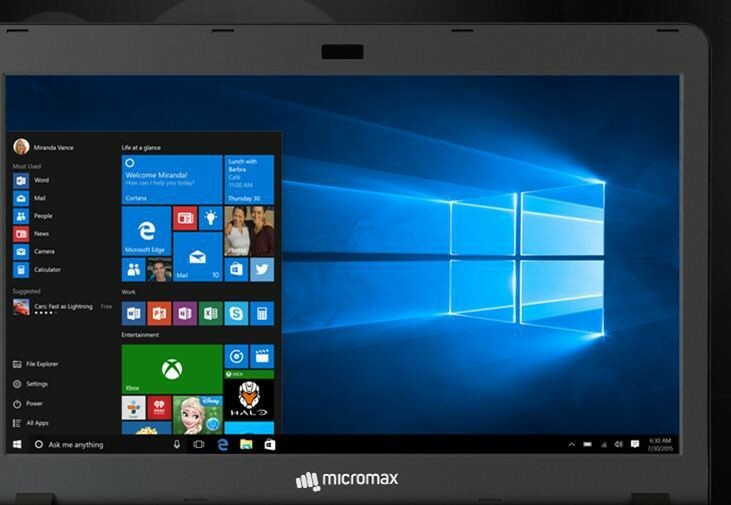 When Micromax entered into the laptop & computer market, no one thought that they would be the strong competitors of some leading laptop manufacturing companies. But, they’ve fought them all & launched budget laptops to stay in the competition. Now the time has come for them to roll out a full fledged laptop which is powerful than their budget series ie: Canvas Laptab. Ignite is powered by an Intel Pentium N3700 Chipset. The beast has 4GB RAM which is more than enough for an average consumer. Display you asked? Well a 14 inch IPS LCD screen present on Micromax Ignite & is very clear & texts are legible to read too. The feature which makes it stand out among others is the inclusion of 1TB HDD. It has two USB ports, one HDMI & an ethernet port also for seamless connectivity. It also has a microSD card reader incase you want something more(what?? even more??). The front Lid contains a 1MP Front camera. The juice is served by the 4500 mAh battery. Hope Micromax comes up with better laptops which aren’t too heavy on the pockets… The Micromax Ignite is available via Flipkart at ₹18,990 from now! Go grab it! Previous article Windows 10 Insider Program celebrates its First Anniversary! It’s great to see an Indian company now in the field of laptops too after smartphones.